The company auctioning the assets of defunct developer 38 Studios has discovered a new, complete but unreleased Rise of Nations game on its servers. 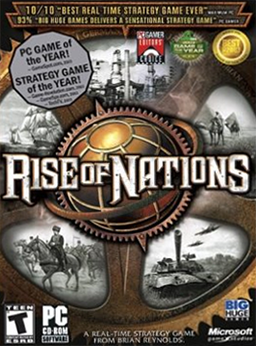 Ever played Rise of Nations: Tactics? The correct answer is "no," because it doesn't actually exist. Except it does exist - but nobody knew about it until yesterday. The auction of 38 Studios assets is happening in December, as you may have heard, and will include things like the rights to various intellectual properties, among them Kingdoms of Amalur, Project Copernicus and, thanks to 38 Studios' acquisition of Big Huge Games in 2009, Rise of Nations. But you can't have an auction until you know what you've got to sell, and while auctioneer Heritage Global Partners was poking through the 38 Studios detritus, it made a very interesting discovery. "Through the examination of the data contained on the 38 Studios servers, we have discovered a completed, but unreleased game for Mac users titled Rise of Nations: Tactics," Heritage Global Partners EVP Nick Jimenez said in a statement. "We only became aware of this game this past week through our own due diligence efforts." The Mac thing is kind of a downer, with all due respect to the Apple fans among you, but it's still a fun discovery - the digital equivalent of discovering a Picasso while cleaning out your garage.